This post will focus on the home (or “fixed”) broadband market, which is usually served by wireline connections such as cable or fiber, and not mobile broadband, which merits separate analysis. The most important perspective is that of the consumer. From that perspective, the overall shape of the broadband market nationwide is not as important as how many choices are actually available. While competition does not guarantee that companies will always act in their customers’ interests (this is why health and safety regulations are important in the restaurant industry, even though in many places it is very competitive), it does at least ensure that some of the most egregious abuses are kept in check. For example, there’s evidence that broadband competition leads to lower prices. Mobile wireless technologies are of course an important part of how people access the internet, but they simply don’t compete with fixed connections. Instead, they offer a complementary, different kind of access. (And it’s worth remembering that the vast majority of smartphone traffic travels over fixed networks, via WiFi, not via mobile networks.) Those who can afford fixed home broadband service tend to buy it, even though they tend to also have mobile service, as well. If fixed and mobile broadband were truly substitutable products that competed in the same market, this wouldn’t happen. Instead, the data show that Americans who are on a tight budget sometimes choose to go mobile-only. This underscores the importance of mobile connectivity to people today (which is, in part, why net neutrality rules are important for mobile too), but it doesn’t show that mobile connectivity has solved the problems of the uncompetitive home broadband market. The lack of competition in home broadband isn’t just an unlucky accident. Sometimes there are markets that could be more competitive, but for various historical reasons just aren’t. 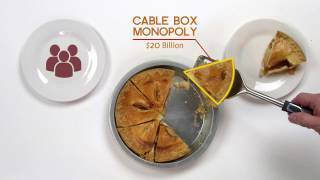 But broadband access providers share many of the characteristics of natural monopolies: They have high fixed costs and low marginal costs, meaning that the first company to build a network will have a better cost structure (and be able to underprice) new entrants. The same companies that are dominant in broadband access today tend to be the same companies (or the successors of the same companies) that first laid down telephone wires, coaxial cable, or fiber in their respective markets. In other markets, new companies can come along from time to time and displace the incumbents; in the last-mile, wireline access network market, this doesn’t happen very often. While it’s true that governments have sometimes colluded with monopolies, economic forces primarily created them. Common carrier rules don’t keep monopolies in place-- they are, in part, a response to them. This isn’t to say that broadband providers always and everywhere are natural monopolies—it’s not either/or. Population-dense areas or areas with a lot of commercial activity can support many broadband providers. (Other areas can’t economically support even one provider without a subsidy.) But structural and persistent reasons, as opposed to more easily fixable conditions, are a central cause of the lack of competition in local broadband markets, which informs the common carriage/net neutrality approach to broadband. In attempting to justify their mergers, large ISPs have recently taken to arguing that, since they don’t compete in each others’ markets, combining them into one company can’t harm consumers. It’s a clever trick, to try to use one of the most anticompetitive features of the broadband market to justify further consolidation. But it doesn’t work, because nationwide concentration has other risks for consumers. The numbers: From a nationwide perspective, using the standard HHI measurement, the broadband market is considered "concentrated," and this is including even slow DSL providers. Just two providers—Comcast and Charter—control more than half the market; add in AT&T and Verizon and you’re at 75%. Additionally, cable and fiber providers together account for about 98% of connections (see figure 22) of at least 25 Mbps, and limiting the analysis to these more robust technologies paints an even starker picture of a "highly concentrated” market. On top of that, the major ISPs tend to control the most crucial media markets, heightening their power. This means that for those creators and services that need to reach broadband users, only a small handful of companies control their fate. If any of the major ISPs decides to block or degrade an online service or media provider, it could be cut off from millions of customers, and potentially driven out of business. If one of the major ISPs decides that an online service has to start paying it a new fee—for example to exempt its data from artificially-low bandwidth caps—saying “no” might not be an option. ISPs are the gatekeeper between creators and users, based on their power to control what traffic gets on their networks and how it is treated. Consumers tend to think that they should decide what kinds of internet content they see, and what services they use, since they’re the ones paying for the networks. But for years, ISPs have had different ideas, and have wanted to charge both sides: consumers to reach the internet, and internet creators and services to reach consumers. This vision is bad enough as it is, but the highly-concentrated nature of the broadband market gives a small number of ISPs inordinate power, and the ability to make whatever demands they want. (In a world with one ISP per town, no one ISP would have such tremendous power over internet companies—it would only control access to its customers, not a large chunk of the country. While consumers would still face the same limited choices, at least the effects on the internet economy would be lessened.) A small handful of internet companies—the Facebooks and Googles of the world—might be able to stand up to overweening ISPs, but the typical online creator or service is simply outgunned. A world where powerful gatekeepers control the internet is bad for consumers. 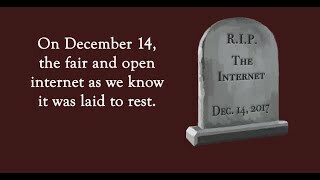 Even if large ISPs had good intentions, bad things can happen when single companies have too much control over people and the economy. Net neutrality rules are not just important for the vast majority of Americans who have few choices when it comes to broadband internet access. They are necessary to stop large ISPs from controlling and manipulating what we can see and do online, through the excessive leverage they have as dominant gatekeepers. Besides the lack of choice for consumers in reaching the internet, and the lack of choice for online services in reaching consumers, there are many other economic arguments for net neutrality. It creates spillover effects that benefit the economy overall. It promotes economic equality by ensuring that startups, smaller companies, and independent creators can compete on fair terms with internet giants. Even when customers do have some broadband choice, it corrects for coordinated effects, switching costs, and other factors that limit the effectiveness of competition in promoting consumer welfare. Beyond these economic arguments, there are social arguments as well. The internet has become central to democracy, as many citizens’ primary or only source of news, the way that families keep in touch, and the way that governments communicate with their citizens. Such a vital platform must be protected, and not left to the dictates of a few bottom-line-driven ISPs. Finally, it’s important to remember that net neutrality is nothing new. Broadband still counts as “new” in the historical scheme of things, but essential services of many kinds—particularly “bottleneck” services like transportation, communications, and energy—have long been subject to nondiscrimination requirements. The FCC has traced common carriage to medieval England. (Those of you with a WestLaw account can look this up at 84 F.C.C.2d 445.) In fact its origins go back even further, to Ancient Rome. Oddly it is some “conservatives” who now seem to think that a time-tested legal principle with such a long pedigree is obsolete. Far from it--common carrier rules serve the same basic purpose today they always have, with some difference of detail owing to new technologies. The First Amendment is old, too, but it applies to the internet, television, and radio--technologies that the founders had no idea about. With the advent of broadband, ISPs went from being an “edge service” like any other telephone user, such as your local pizza shop, to being an integrated part of the network. While there was once a hope that cable, DSL, and broadband over power lines might make the access market fundamentally more competitive, this didn’t happen. As discussed above, for most people wired communications services are no more competitive today than they ever have been. But many in Washington, including the current Chairman of the FCC, would prefer to ignore the realities of the broadband market and pretend that it is competitive, usually by conflating online services with internet access or by imagining that mobile services are adequate substitutes for fixed connections. But broadband internet access is just as much a bottleneck service as the old telephone monopoly. Sensible common carrier rules remain the best approach, instead of reckless deregulation that transfers control from internet users to the broadband monopolies.